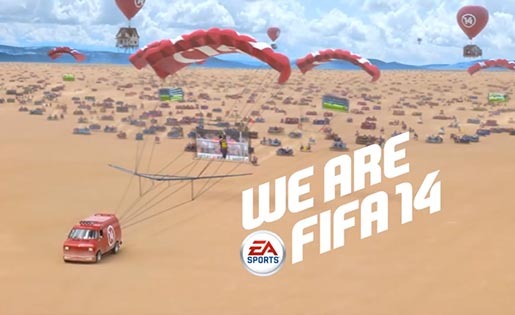 Electronic Arts is promoting EA SPORTS™ FIFA with “We are FIFA 14”, a global campaign featuring professional footballers Lionel Messi, Gareth Bale, Stephan El Shaarawy, Tim Cahill, Javier Hernandez ‘Chicharito’ and FIFA-loving celeb Drake. 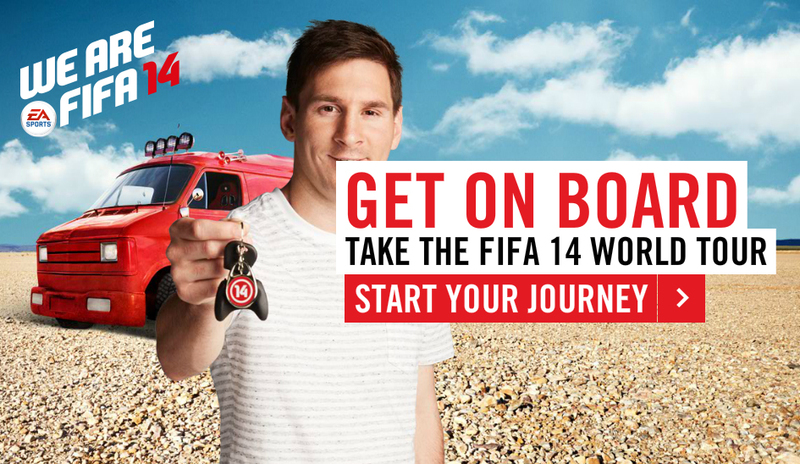 The ‘We Are FIFA 14’ film depicts an armada of football fun, led by Lionel Messi driving a bright red FIFA van. Messi is the pied piper of FIFA 14, pulling a set of enormous TV screens suspended by parachutes behind him and attracting gamers of all shapes and sizes. Those who join the FIFA 14 armada are not on the usual sailing ships, but on lounges, couches, hammocks and beanbags, anywhere you play FIFA on wheels. The ‘We Are FIFA 14’ journey continues online with the FIFA 14 World Tour, a website housed on the EA SPORTS main site incorporating a further series of short films. Taking the form of an interactive 3D map, the site is a world of FIFA 14 inspired content waiting to be explored. From a Mexican FIFA 14 telenovela starring ‘Chicharito’, to an Australian FIFA exercise show with Tim Cahill, the FIFA 14 World Tour site leaves fans in no doubt that FIFA 14 is the most fun and social game on the planet. The We are FIFA 14 campaign was developed at Wieden+Kennedy Amsterdam by executive creative directors Mark Bernath, Eric Quennoy, creative directors Mike Farr and Pierre Janneau, art director Ignasi Tudela and copywriter Dave Smith (TVC), art direct Andy Parson and copywriter Fred Rodwell (digital), head of production/agency producer Erik Verheijen, agency producers Javier Perroud and Jaime Tan, planner Ben Armistead, communications planner Richard Oldfield, group account director Kirk Johnsen, account director Nick Campion, account manager Kerstin Hagg, studio artist Philip Cronerud, project manager Janna Harrington, business affairs team Barrie Williams, Justine Young, working with Electronic Arts SVP, Global Marketing Todd Sitrin, VP, Global Marketing Jamie McKinlay, international marketing director Oliver Hughes, assistant product manager Audrey Prince, assistant product manager Thomas Gaidier, global senior product marketing manager Matt Mckie, senior manager, advertising & media Mark Evans, senior regional marketing director, Northern Europe, Andrew Tomkins, and director, advertising Dustin Shekell. Filming was shot by director Stacy Wall via Gorgeous, London, with director of photography Ben Seresin and producer Ben Link. Editor was Ben Jordan at Work Post with assistant editor Ellie McNaughton. Audio post production was done at Grand Central by sound designer/mixer Raja Sengal and additional track lay by Tom Pugh. Music, “Some Place”, was composed by Nick Waterhouse and published by Shy Guy LLC. Post production was done at The Mill by Flame team Dan Adams, Neil Davies, Pete Rypstra, Joe Tang, Ilia Mokhtareizadeh, Brad Wood, 3D artists Aidan Gibbons, Dan Moore, Marta Carbonell, Alberto Della Regina, Peter Agg, Michael Hunault, Jessica Soderstrom, Adam Darrah, Joakim Riedinger, Michael O’Donoghue, Liz Mitchell, Sergio Xisto, Scott Bono, Benoit Moranne, colorists Mick Vincent, Mikey Rossiter, producer Sophie Hogg, Nuke artist Alexander Kirichenko, Final Cut editor Charlotte Carr, shoot supervisor Hitesh Patel, concept artists Alex Caldlow, Jimmy Kiddell and Geman Casado. The Digital FIFA 14 World Tour campaign was developed at AKQA by executive creative director Ivar Eden, creative director Rob McIntosh, senior creative Ron Engelbert, senior designer Steve Wilcox, designers Joao Tavares and Joao Mestre, account director Chris Henderson, account manager Claire Knight, project manager Jolly Banerjee, technical delivery manager Haralampi Staykov, senior creative developer Ferdi Koomen, software engineer Eoin Roberts, QA manager James Davis and senior analyst Anna Hughes. Filming was shot by director Nils Gerbens via 100% HALAL with executive producers Gijs Determeijer, Gijs Kerbosch and line producer Poeiwah Cheung. Editors were Will Judge and Justin Magness at The Gentlemen’s Club and Magness Animation. Audio post was done at Wave Studios, Amsterdam, with producer Ben Tomlin, sound engineers Alex Nicholls-Lee and Randall MacDonald. Post production was done at MPC London by director Tim Philips, producers Jamie Loudon, colourist Matt Osborne, lead VFX artist Jim Spratling, Matte painter Callum Strachan, AFX animation team James Brocklebank, Timo Lenton, Nuke artists Mike Simmons, Lisa Ryan, and Smoke artist Cynthia Lee. Digital production was done at AKQA Film by senior producer Elin Tiberg. Photography was by Finn Taylor with assistant photographer Arash Fatehi, digital operator Nick Pearce and retoucher Sipke Visser.